In episode 93, Rosie and Jessica catch up on Galentine’s, Valentine’s and 90th birthday parties. There’s a rogue carb-based Top 5 and the arrival of a new feature, the Late Review, where Rosie and Jessica discuss the 2014 movie version of Into The Woods. Then it all gets a bit weird and there’s lots of talk about pants. 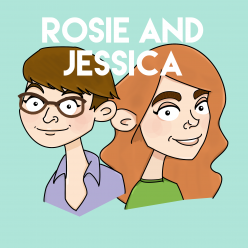 In episode 92, Rosie and Jessica report back from fixing the world’s problems (you’re welcome.) Some dodgy lightbulb-based cooking tips are swiftly rescued by a Top 5 Cookery Shows which, as with all food-based Top 5s, is VERY intense. We hope your week is not too troughy. In episode 81, Rosie and Jessica get caught up on this series of the Great British Sewing Bee and also Jessica’s kitchen renovations. They delve into songs with spoken segments in Top 5s and Jessica has seen some horribly misused vegetables on the tube.